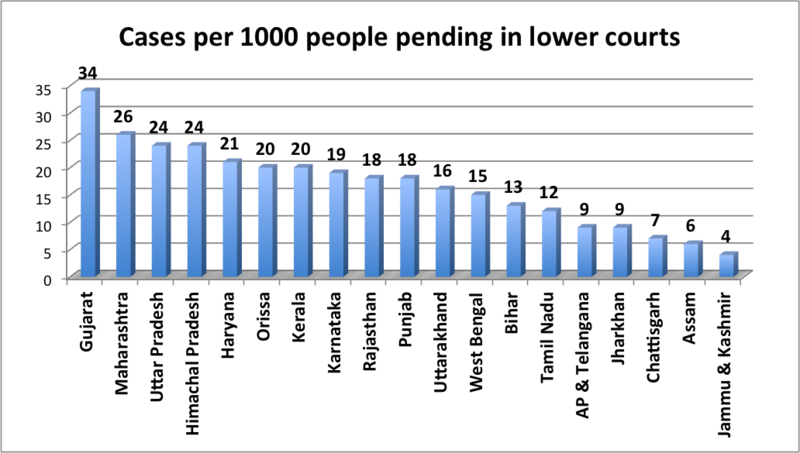 A top data analysis website has revealed that, as of October 2015, Gujarat has the highest number of cases per 1000 people pending in its lower courts. 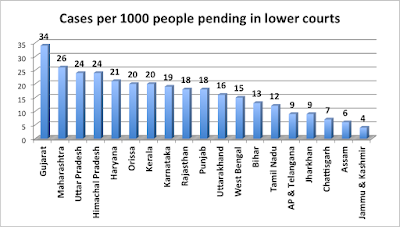 While the all-India average of pending cases is 18 per 1000 people, Gujarat can have the distinction of having almost double as many pending cases – 34 per 1000. The states which closely “follow” Gujarat are Maharashtra with 26 cases per 1000 people, Uttar Pradesh and Himachal Pradesh 24 each, Odisha and Kerala 20 each, Karnataka 19, Rajasthan 18, Punjab 18, and so on. The data go a long way to suggest that the Gujarat government’s much-hyped evening courts "experiment" to clear the backlog of cases, begun in 2006, when Narendra Modi was the state’s chief minister, has failed. The evening courts experiment was begun to showcase Gujarat’s “model” of bringing justice to the grassroots level. Pointing out that is because, as against Gujarat’s sanctioned strength of 1,963 judges, there are a whopping 747 vacancies, the highest in India, followed by 643 in Bihar out of the sanctioned strength of 1670, followed by 336 in Uttar Pradesh against the sanctioned strength of 2,097, Rajasthan 314 against the sanctioned strength of 1145, and Maharashtra 288 against the sanctioned strength of 2072. An report in the website, based on the data it has made public, says, “Going by the current rate of clearance, it will take the state’s lower courts 287 years to decide pending cases in Gujarat.” “India’s lower courts, burdened by more than 25 million pending cases, need at least 12 years to clear the backlog”, the report adds. It quotes former Supreme Court Judge Justice Santosh Hegde to say that there appeared to be “something wrong” with Gujarat’s lower judiciary. “Either the state high court is not paying attention or everybody has gotten used to the way the system works,” says Hegde. 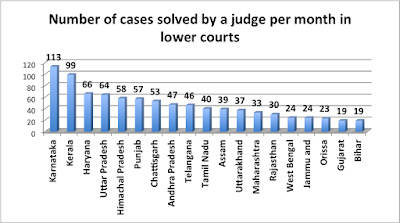 A comparison suggests that lower courts in Karnataka “appear to be working efficiently. At last month’s rate, the courts would be able to dispose of all pending cases within three years”, adds Hegde. 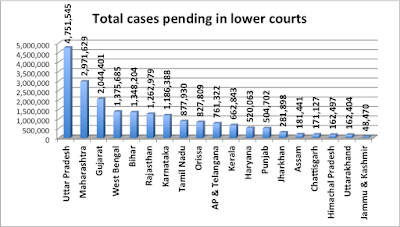 Data further show that Gujarat has 2,044,401 cases pending in its lower courts, 577,678 civil and 1,466,723 criminal. While Gujarat makes up a little over five per cent of the country’s population, the number of cases is 10.13 per cent of the country. 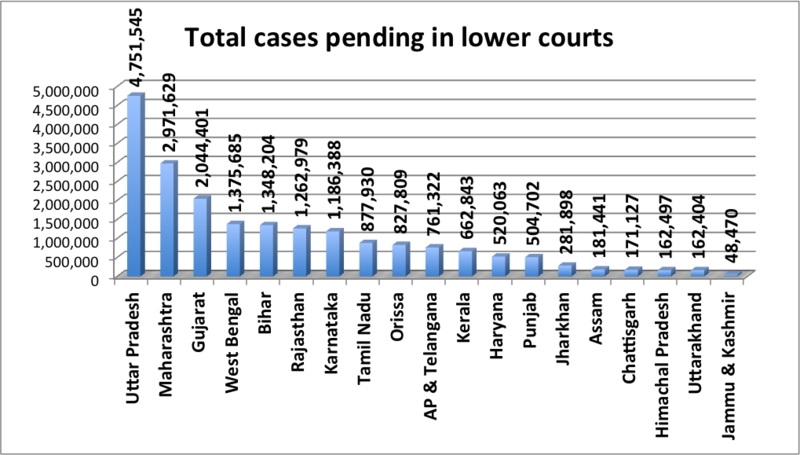 Two states have a higher number of cases pending than Gujarat – Uttar Pradesh 4,751,545 and Maharashtra 2,971,629. 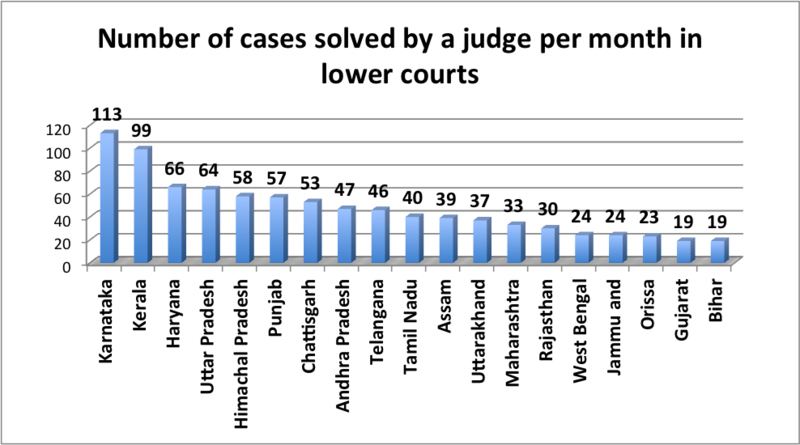 Pointing towards the “below-average efficiency of judges in the state”, as just 19 cases per judge are solved in Gujarat per month against a national average of 43 cases, the data suggest that the highest number of per judge cases are solved in Karnataka (113), followed by Kerala (99), Haryana (66), Uttar Pradesh (64), Himachal Pradesh (48), Punjab (57), Chhattisgarh (53), Andhra Pradesh (47) and Telangana (46).